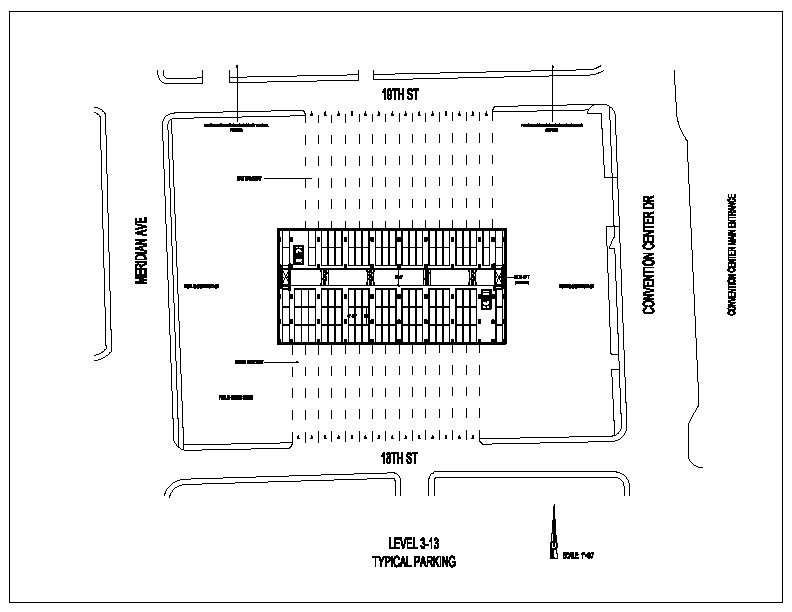 The sketches related to the Miami Beach convention center illustrate what is possible on larger sites where parking traffic is event driven with certain time-in and time-out attributes. In this case, the three row by two row (3x2) storage plan on the upper floors of the parking structure are conditioned on the expectation that traffic into and out of the Miami Beach Convention Center will be steady during the days of convention center events. This particular design would not be appropriate for a stadium event due to the deeper rows of storage on the garage’s upper floors. A different automated garage plan would be required for a stadium event (e.g. basketball or baseball game, or rock concert) where almost all incoming traffic arrives in the 45 to 90 minutes before an event and departs immediately after the event. For such stadium and similar events, a greater number of entry and entry bays, internal shuttles and lift components would be required, as well as a one by one (1x1) or one by two (1x2) storage plan on the upper floors. The former (more entry and exit bays and internal devices to move vehicles) enable the garage to more rapidly accommodate the movement of vehicles into, within, and departing from the garage. The latter (a 1x1 or 1x2 plan) means most or all vehicles in the garage are closest to the internal shuttles which facilitate faster storage and retrieval of vehicles. In turn, this increases machinery speed and allows more vehicles to be stored and retrieved during the rush periods before and after the event. Even with the caveats above, an automated garage may not be feasible or advisable for certain stadium events. In such cases, the rush of parking patrons in or out of the event may be too great, the parking site may be too constrained, or the cost to provide a sufficient number of shuttling and lifting components may be too high, to enable an efficient use of automated parking technology on the subject site. © 2016 Easy Park All Rights Reserved.